26th August 2015. A young child is lifted from a boat containing approximately 650 people by Sebastian Stein (MSF Coordinator) during a rescue in the Mediterranean Sea by the Bourbon Argos. The world currently faces its largest global displacement crisis since World War II, with approximately 60 million people currently displaced due to conflict, persecution, and untenable conditions in their home countries. While foreseeable, Europe is still reeling in shock from the sheer numbers of refugees and migrants—approximately one million—who crossed its borders in 2015. 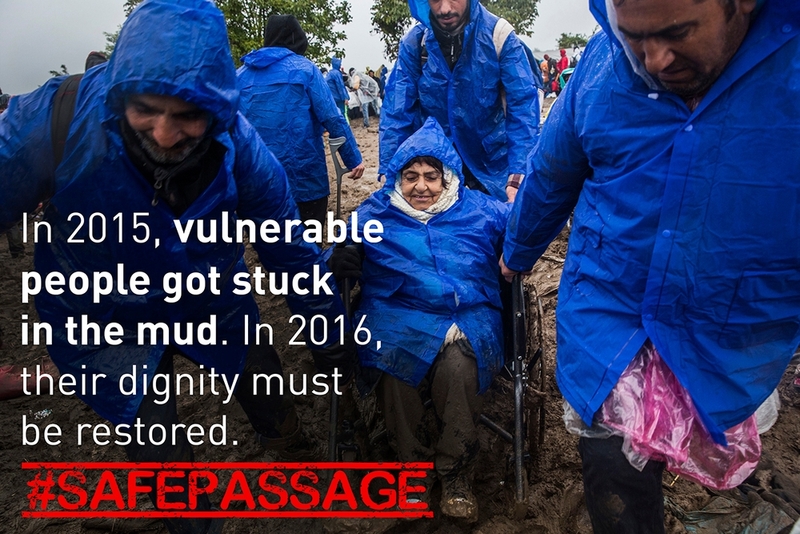 It will be remembered as the year in which Europe catastrophically failed in its responsibility to respond to the urgent needs of assistance and protection of hundreds of thousands of vulnerable people. Not only did the European Union (EU) and its member states collectively fail to address the urgent humanitarian and medical needs of refugees and migrants arriving at external or internal EU borders, but the EU’s deterrence and anti-immigration policies—developed over the last 15 years and further strengthened in 2015—have increased the demand for migrant-smuggling networks and pushed people towards ever-more dangerous routes which jeopardize their health and lives. These policies have largely contributed to the patterns of the reception crisis we are witnessing today: with those desperate to come to Europe forced to cross the sea and southern EU countries failing to respond to their needs. Facing razor wire fences, closed borders, and intimidating soldiers and police forces from Turkey through most of the Balkans; highly dangerous sea crossings to Italy or Greece; squalid and inhumane reception conditions; and complicated and ever-changing registration procedures, thousands of men, women, and children fleeing conflict and desperate conditions have had to face another obstacle course, this time through Europe. Countless meetings, conferences, and plans have been organized by the EU and its member states throughout 2015. Despite this, most states have been unwilling or unable to provide assistance to the refugees and migrants who make it into the EU. As of November 3, 2015, 14 member states had collectively made 2,284 relocation places available out of the 160,000 pledged, and only 86 people had effectively been relocated from Italy. The traditional state and UN-sponsored aid system has also struggled to adequately respond to people’s needs. Instead, civil society and volunteer groups, better able to work around administrative, institutional, and political blockages, have emerged as key to providing refugees and migrants with essential services throughout their journey. At the core of these non-state activities has been an overwhelming upsurge of solidarity from citizens across the world volunteering their time, donations and money to assist the tens of thousands of refugees and migrants in need. As an emergency medical humanitarian organization, Doctors Without Borders/Médecins Sans Frontières (MSF) scaled up its operations in Europe throughout 2015 and focused on setting up mobile responses to tend to the needs of these unprecedented numbers of people on the move. Never before has MSF had so many projects in Europe, never before has MSF decided to mobilize three search and rescue ships at sea to save lives, and never before has it been more urgent for European governments to step up to their international obligations and assist these people whose lives are at risk. Increasing humanitarian aid to camps in Lebanon, Turkey, or Jordan, even if urgently needed, does not absolve EU member states of their responsibilities to receive, assist, and protect refugees within EU territory, and it will not stop people seeking safety in Europe for complex reasons. In denying vulnerable people dignified reception conditions and blocking and pushing back people based on their nationality rather than vulnerability and risk of persecution, European states have eroded the very foundations of international refugee and human rights law. 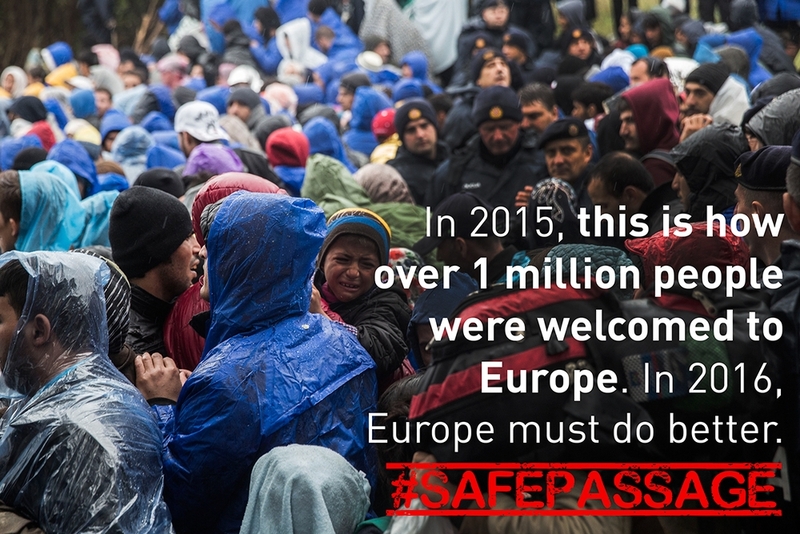 With a new year ahead and a few months before another potential peak in arrivals, Europe and its member states have the opportunity to right the wrongs of 2015. Europe must dismantle its obstacle course and provide assistance and safe, legal passage to refugees and migrants fleeing desperate conditions. 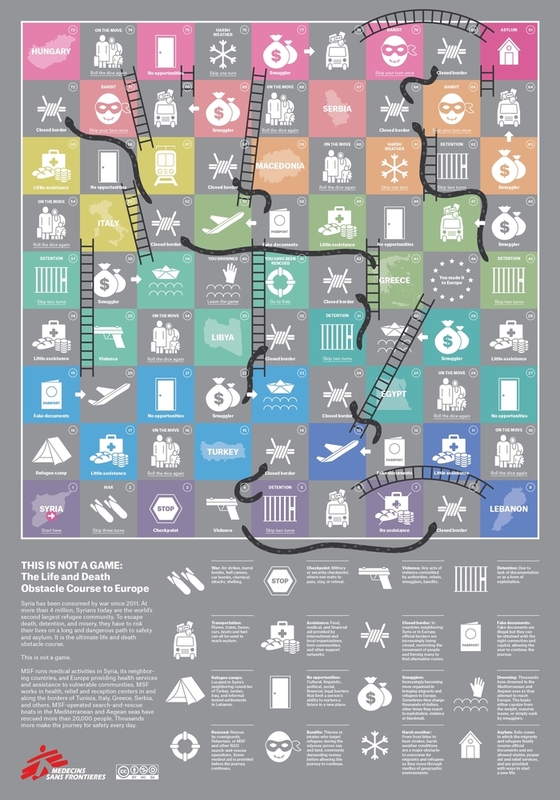 This report tells the stories of men, women, children, the elderly, the sick, and the disabled; traveling alone or with their families; fleeing war, persecution, or extreme poverty and seeking refuge and a better life in Europe—people who were left with no other choice than to navigate the obstacle course to Europe. It highlights how the EU’s response so far has not only failed to respond to the urgent humanitarian and medical needs of these vulnerable populations, but has also contributed to the worsening of their situation, with a sometimes tragic impact on their health and lives. The report spells out that Europe cannot continue to count on the deadly sea crossing, fences, and poor reception conditions to act as a "filter of deterrence." The current narrative and policies cannot hold. As instability continues to rage across Syria, Libya, Iraq, and Afghanistan, the EU and European governments must shift their current policies and provide a humane and humanitarian response to refugees and migrants desperately seeking its protection and assistance. Swiftly provide safe and legal channels for people seeking asylum, in particular allowing asylum seekers to apply for asylum at external land borders, including the Evros land border between Turkey and Greece. This also includes making wider use of legal entry schemes, such as (for example) family reunification, humanitarian visas, simplified visa requirements, resettlement, and relocation. Create legal migration pathways to decrease the demand for irregular migration and smuggling networks. Create an ambitious search and rescue mechanism to save lives at sea. This operation should proactively search for boats in distress as close to departure points as possible and should be accompanied by pre-identified disembarkation points where humane disembarkation procedures, including adequate reception conditions, medical care, and vulnerability assessments are in place. Invest in reception according to EU standards instead of deterrence measures only. Europe must move away from a fortress approach to a reception approach designed to address the needs and specific vulnerabilities of people arriving at its borders, in particular their medical and mental health needs. In the absence of a functioning common European asylum system, invest more ambitiously in intra-EU relocation schemes and the creation of safe passage through the EU. Put an end to acts of violence and abuse from state authorities and criminal groups. Seventeen percent were women and 25 percent were children under the age of 18. In 2015, MSF teams provided just under 100,00 medical consultations to refugees and migrants on its search and rescue vessels in the Mediterranean Sea, in Italy, Greece, and throughout the Balkans. Between May and December 2015, MSF rescued and assisted 23,747 refugees and migrants at sea, bearing witness to and treating the physical and mental health consequences of the terrible journeys and the lack of basic assistance, as well as injuries and mental health trauma sustained by violence. Most of the pathologies treated by MSF medical teams could have been easily prevented if a safe passage and reception up to humanitarian standards had been put in place by EU states. MSF medical teams in Greece and Serbia treated 12,214 patients for trauma-related conditions, which represents 18 percent of all medical consultations in these two countries. Among the 408 most severe trauma cases, 70 percent reported physical violence, robbery or verbal abuse and intimidation experienced during their journey. Forty-five MSF staff members and 11.5 million euros were mobilized to carry out search and rescue operations on three vessels in the Mediterranean Sea. A further 489 staff and 20 million euros were mobilized to respond to the humanitarian needs of refugees and migrants in Italy and Greece, the Balkans, and in their countries of destination.